Militant group NDFB had vowed to kill 20 'Indians' to avenge the death of one Bodo, however, when the militants of the banned outfit carried out four strikes across Assam, gunning down 21 Hindi-speakers it was almost ignored by mainstream media. Times of India published the news on page number 15. The headline didn't mention the word 'terrorists'. Other newspapers also treated the news in the same manner. The fact that the four coordinated attacks in Assam occurred when US President Barack Obama was in India and still the news got filtered, is the all the more surprising. In fact, when tackling terror is on the agenda, such news always gets even more highlighted. Stress is given that such mindless killings are all the more reason why terrorism has to be dealt with sternly. However, the Assam strikes were just not taken seriously. TV channels who generally go hysteric when even a bullet is fired [remember gunshots near Jama Masjid recently] and hardly anyone is critically injured, flashing 'Possibility of Terror Attack Not Ignored', were not interested. And it's not that incidents in Assam have been totally ignored earlier. On this occasion, Bodo groups had earlier said that they would avenge the killings and they killed Hindi speakers. 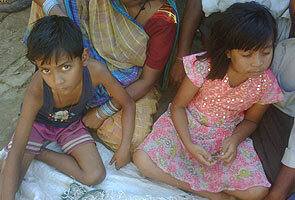 Minor kids were orphaned, women widowed in this killing spree in India's North East. In fact, the final figure after the recent attack touched 25. ﻿﻿﻿ Times of India published the news on page 15. The headline said 'Bodo rebels kill Hindi speakers' while Express carried it on page 10. The Indian Express headline was NDFB pulls men off bus, gus 19 in Assam. Nowhere the word 'Terrorist' or even 'Militant' was mentioned in the headlines. Who knows NDFB outside North East. When the word terrorist is not used, when news reports are hidden deep inside papers and when channels simply ignore such incidents, what will happen? Terrorism will remain associated to just a religion or organisations with Arabic-sounding names. It is media coverage that is responsible for creating images in public mind. Even Hindi dailies didn't consider it worth while to carry it on page 1. Dainik Jagran did carry the news on front page but it also didn't mention the word 'Aatanki'. During the anti-Hindi/anti-Bihari[or UP] agitation in Maharashtra, one or two lives were lost. But Hindi media in North India had reported it extensively. However, on this occasion planned killings of Hindi speakers were treated as no-news. They were taken off bus, separated from others, lined up and shot dead. The National Democratic Front of Bodoland (NDFB) has been described as 'anti-talk faction' in most reports. It has been responsible for the serial bombings in Assam in 2008 also. Of course, here there is no reference to words like terror modules or the particular terminology used in such reports. Wouldn't this led to feeling that media is knowingly or unknowingly complicit in creating false impressions. I don't know if this journalism is bad or biased but it is simply bizarre. Soul-searching, introspection are oft-repeated words but what will change this perception? When newspaper headlines read as 'Terror invades Assam' or 'Terror strikes once again' on front pages, it creates panic and national debate. Dilute the words, put the news somewhere on page 15 and see how everything is hushed up.